Good morning everyone! Are you ready for another fantastic Sketch Challenge from Stamping 411? Our sketch queen, Selene, has come up with a super one this week! It has tons of possibilities so let's get started! I'll tell you how I made mine and then you can go create your own card or scrapbook page and upload it to the Stamping 411 Blog. My card started simply with a piece of already cut Elegant Eggplant cardstock that was sitting on my work table waiting to be put away. Sometimes that's how I let inspiration hit me, using something that is already sitting out and letting my designs style go from there. This piece was a half sheet that measured 5 1/2" x 8 1/2". I folded it in half with my Bone Folder to make a card sized at 4 1/4" x 5 1/2". After looking at the sketch layout for a minute, the light went on for me and I pulled out my Delightful Decorations stamp set with those gorgeous and fun ornament stamps. To create my ornaments, I stamped them twice on a Very Vanilla cardstock scrap using Elegant Eggplant Craft ink. I then used my Heat Tool to emboss them with Iridescent Ice Embossing Powder. After they cooled, I punched them out with my coordinating Ornament Punch. They were then set aside and I got to work on my panel. The center panel is two pieces, Brushed Gold cut at 4 1/2" x 3 1/4" and Very Vanilla cut at 4 1/4" x 3". To create the designs like they are laid out in the sketch, I pulled out my Stamp-A-Ma-Jig and got to work. First I stamped the little star like flower from Delightful Decorations using Gold Encore ink. After stamping it 3 times, I got out my Heat Tool again and embossed them with Gold Embossing Powder. Then, I took the greeting from the Teeny Tiny Wishes stamp set - I've been using that one a LOT lately - and with my Stamp-A-Ma-Jig, I positioned it correctly and stamped it under the gold flowers in Elegant Eggplant Classic ink. Once the stamping was done, I layered my two cardstock pieces together and then I used my Mat Pack and Paper Piercing Tool and punched holes in the center of the three flowers. Then Gold Brads were added for the centers. A trick I use for adding my brads easily is to use the edge of my Bone Folder to fold back the brad prongs once they've been inserted in the hole. They are sharp little suckers and this way, you don't accidentally stick yourself and ruin your project. Ask me how I know! LOL! Now, assembly time. I added Stampin' Dimensionals to the back of the Brushed Gold layer so it would pop up when mounted to the card front. Then I added two more Dimensionals to the back of one of my ornaments so it too would stand out a bit. The ornament tops were each tied with a piece of Gold Elastic Cord in a little bow (this is done easiest by sticking the ornament down with some removable adhesive to your work table and tying the bow while it is anchored there.) and then I added an additional piece of Gold Elastic Cord for the string. Once I adhered the ornaments to the card front, I adhered the string to the back of the gold cardstock. Lastly, I adhered these layers to the card front and I was almost done! I had to do the inside too! So, I pulled out my Many Merry Messages stamp set and chose an appropriate greeting for this card and added yet another gold star flower next to it on a piece of Very Vanilla cardstock cut at 4" x 5 1/4". This was then adhered to the inside with SNAIL adhesive. I really love how this card turned out and my stamp campers may be seeing this one again! 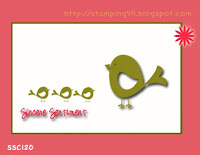 Be sure to play along with us at Stamping 411 this week by uploading your project to the blog. You can use the Mr. Linky widget provided for you there. We love to see your creations! You never know if you'll be chosen for the top 5! Happy weekend all, I hope you have a wonderful one spent with the ones you love most! Wow, this card is so very elegant! I'll be caseing this one for sure! Thanks so much for all the lovely work you do! Oh my word!!! This is gorgeous....and it's purple. You definitely need to make this card at Stamp Camp. They will adore it!!! Your card is beautiful! Aren't these stamps and matching punch the greatest thing since sliced bread?! Wow just so lovely the christmas ornaments. Very pretty card--love the embossing and colors you chose. This is such a wonderful card....I had to look really hard to figure out what the color was---I never used Eggplant, but wow, how "elegant" it is! The gold embellishments really add just the right touch! Thank you for your kind comment on my card, too! This is so rich and beautiful. Awesome colors ~ will be a hit at stamp camp. Looks fantastic! Great job with the 411! Robin, I just the this card....it's so elegant and rich. I'll be casing this one!! Oh, I just LOVE the purple and gold you used! Great job with this sketch...I love it! I want to come to your Stamp Camp!